Online poker’s 2012 legislative chances took a hit last week. 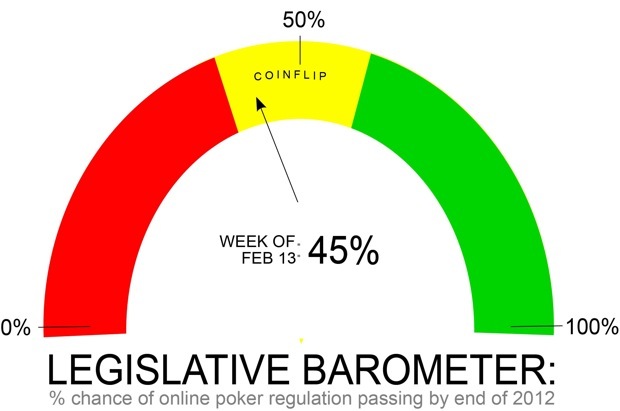 Since we debuted our legislative barometer, we’ve maintained a greater than 50% chance that online poker gets regulated at the Federal level in 2012. Not any more. The drop in our barometer (from 58% to 45%) stems mostly from U.S. lawmakers not attaching an online gaming bill to the payroll tax cut extension last week. Regardless, we’re not as bearish as some that there’s now no chance online poker legislation gets passed this year. We’ve always contended that if an online poker bill would get pushed through Congress–it’d be attached to an omnibus bill during the lame-duck post-election month at the end of 2012. Our opinion on that scenario has not changed. However, the whispers we’re now hearing is that the Fed are more likely to sit on the sidelines and let the States establish the market first, then come in and legislate. That’s great news for Nevada, which some insiders we’ve spoken to believe will have online poker sites up “within 3-4 months.” Many believe that California, New Jersey, and maybe even Iowa will be soon to follow.